Have you ever imagined how Manila looks like and all the small little things in Manila? The places to visit, food to try, location, and even the cultures of its people? Today, I will share some things about Manila & its people due to my 45 days of experiences in Manila last year. I’ll share about their language, culture, temperature, places to visit, souvenirs, and also food to try. Philippines is an archipelago state that located in south-east asia. It was the most developed country in ASEAN after World War II. But then it has lagged since the economic growth is too low. The main reason why it can happen is because there are a lot of corruption in this country. Philippines is often regarded as the only country in Asia that has a strong influence of Western Culture. And Manila, is the capital of the Philippines which is located in the northest island of Philippines, named Luzon Island. Most of the people religion there are Chatolic (80%), followed by Moslem in Mindanao and the south part of Philippines (11%), and the rest are Buddhist, and Protestan. There are 2 main languages that widely spoken in Manila. The first one is Tagalog Language. It’s being the first language of Filipino. But beside that, almost 85 percent of the Filipino in Manila can speak English well. Even the security and public transportation drivers can speak English fluently. It can happen because Philippines was colonized by Spain and also USA. The temperature in Manila is almost the same with the temperature in Indonesia. It’s around 30 celcius degree. There are 2 seasons in this country; wet season and dry season. 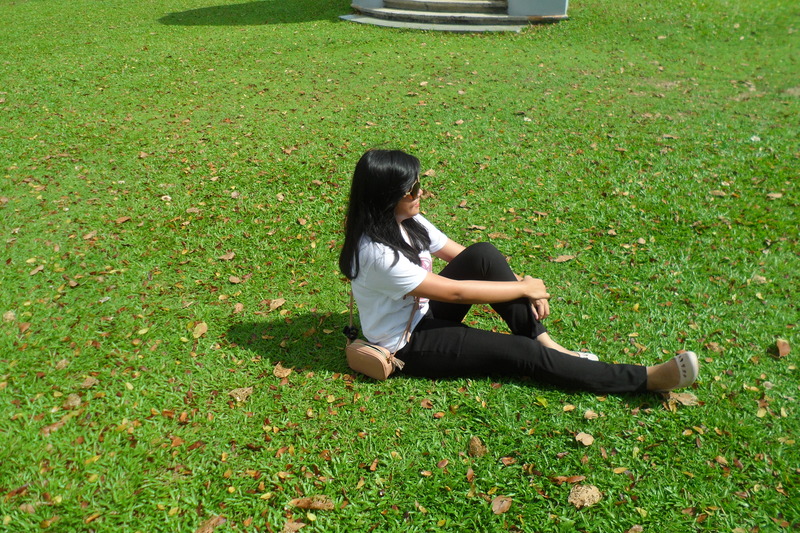 Intramuros, is a walled city in colonial times. It’s located in the heart of Manila. I went to this place twice when I was in Manila, since this is a very beautiful place to visit and hunting pictures. You can find some beautiful places inside Intramuros. Some of them are Casa Manila, Fort Santiago, Manila Cathedral Church, and San Agustin Church. Casa Manila is a museum in Intramuros depicting colonial lifestyle during Spanish colonization of the Philippines. It’s being one of the most favourite places to visit in Intramuros, said the local people. Fort santiago is one of the most important historical sites in Manila. It was built on the 16th century, during the Spanish Colonization. It’s only a few meters away from the Manila Cathedral. Manila Cathedral Church is a roman catholic church inside Intramuros district, Manila. It becomes one of the most coveted wedding venues in Manila for couples who want a wedding venue to symbolize their love for each other. This 444 year-old historical site, which undergone preventive repairs in 2012, is decked with beautiful black marble flooring, charming brickwork, and an improved central nave and vaulted ceiling that captures Spanish architecture elements. San Agustin Church is also a roman catholic church inside Intramuros district, Manila. In 1993, it was one of four Philippine churches constructed during the Spanish colonial period to be designated as a World Heritage Site by UNESCO. It was named a National Historical Landmark by the Philippine government in 1976. In Intramuros area, you can rent a calesa (horse carriage in Manila) or a trycycle. But be careful with scam when you rent it. Some times the trycycle drivers can be annoying by asking us with a little force to rent their trycycles. Not only once, but several times. The price of both trycycle and calesa are extremely higher in Intramuros than in another area in Manila. Based on the local people I was asking to, there are 4 best universities in Manila : University of the Philippines (UP Diliman), Ateneo de Manila University, University of Santo Tomas, and De La Salle University. I had visited all of them. But in my personal opinion, the best university building to visit for hanging out and taking pictures in Manila goes to University of Santo Tomas (UST). UST is one of the four best universities in the Philippines. It’s a private, Roman Catholic research university located in España Blvd, Sampaloc, Manila, the Philippines. When you come there, you will feel really comfortable with the situation. The green park, the breezy wind, the clock’s ring, and also the beautiful European architecture building. This art museum (not really a museum) is the largest 3D art museum in Asia. It’s owned by 18 Korean master painters and was opened in December 2014. The museum had over 200 masterpieces, including reproduction of works of masters, animals, Egyptian ruins and others. These arts give the illusion of depth when viewed from a certain angle, and is designed to serve as a backdrop for photo opportunities. There are many differenr themes (zones), such as underwater zone, animal zone, christmas zone, religious zone, fantasy zone, central hall, and so on. The entrance fee for adult is P500 (IDR 150.000 or around 11.5 USD). But you will get 20% discount if you bring your student ID card or if you are a senior adult. Binondo is a district in Manila and referred the world’s oldest Chinatown. This city is famous of its nightlife and bars. I never go here for enjoying the nightlife, but the local people said that it’s a good place for enjoying the night. If you like to go clubbing or drinking, this city provides a lot of nice bars! Actually it’s located inside the same area with SM Mall of Asia, Pasay City. You can go to Manila Bay by entering this mall. It’s not too far from the airport. People use this place for seeing the sunset at evening, or enjoying the view of MOA eye. From this LRT Station, you can see beautiful buildings. There is a pretty Bank of the Philippine Island Building. Since the majority religion of Filipino are Catholic, there are a lot of beautiful churches in the Philippines. I cannot mention it one by one since it’s quite a lot. Just stop and look inside when you find beautiful churches along your way. If you want to buy t-shirts and good quality souvenirs, I suggest you to visit a store called Kultura. The price is quiet affordable and the t-shirts are very nice. If you want to buy dried mangoes, you can find it everywhere (inside a mall, or even supermarket). But I recommend you to buy the “Profood Cebu Philippines Dried Mangoes”. The price is slightly higher, but I can say that this brand provides the best taste! Both the green package and also blue package are taste good. THIS IS A MUST TO TRY! Since I can’t find this product outside the Philippines. Go to Goldilocks Bakeshop, and try this item! From 1 to 10, I can say that the taste is 9.9/10. I suggest you to buy the POPCORN! I have 2 good brands to try : Chef Tony’s Popcorn and Goldilocks Popcorn. Chef Tony’s popcorn is a little bit expensive, but it provides a lot of variances. The packaging is nice, because it uses a plastic round container. The taste is also nice. You can find it also in another countries (I heard that Singapore also sell this popcorn). Another cheaper and nice option is Goldilocks Popcorn. The popcorn is different from Chef Tony’s because this place only sell the caramel popcorn. But it’s also nice!! Mango is being the most favorite fruit in the Philippines. You should go to a restaurant named Iceberg’s and try the Mango Ice Cream. The portion is quite big and I think you can share it with someone. There are the fresh mangoes and also mango ice cream in one glass. If you have a strong mental, go try this food. There are fried balut and also the boiled one. I just dare to tried the fried one, since the boiled has a disgusting shape. And you know what, I dared to try 4 days before I was leaving Manila. In the first 41 days of my 45 days journey in the Philippines, I still feel afraid to try HAHA. Just try random street ice cream from random ice cream sellers. The price is very cheap and the taste is unique. It’s located in Echostore Centris Walk. The price per small container is P120 (last year, 2016). Go try the salted caramel & cookie dough flavours!! Bibingka is baked rice-cakes in banana leaves topped with a variety of cheese & salted duck egg. You can buy in Bibingkinitan stores. YOU CAN ONLY FIND IT IN THE PHILIPPINES. Try try! Halo-halo is a popular Filipino dessert with mixtures of shaved ice and evaporated milk, boiled sweet beans, coconut, sago, jelly, and fruits. It usually served in a tall glass or even bowl. Similar to “Es Campur” in Indonesia, but has different toppings. I think that’s all from me about Manila. Hope the information would be useful for everyone who need it. Try mango, mango, and mango! Since the mango in Philippines is very nice. H i r e a d e r s ! I have another backpacking story to tell about. This is not only about the marvelous places I went to two weeks ago, but also the very long ups and downs stories behind it. Thailand! This is one of my tons bucket list before I came to Malaysia and this is my fifth country from the 10 countries of ASEAN. It took more than 15 hours to go to Krabi, Thailand from Malaysia by bus. Krabi is being one of the most popular tourism places in Thailand. The rests are Bangkok, Pattaya, Chiang Rai, and Phuket. Oh ya! Phuket is only around one and a half hour by car from Krabi. And you can cross the sea to visit Phi-Phi Islands also from Krabi. Crossing Thailand-Malaysia’s Country Border Using a Motorcycle. WOW! Like an action movie isn’t it? Let the story begin! Our bus from KL to Hatyai was delayed for more than 2 hours. The most annoying thing is that the bus terminal staff didn’t tell us that the bus is already coming and we need to move to another gate. They just told me when I was asking for more than 5 times. Annoying me, right? Yes I know that I’m quite annoying since I was keep repeating the same questions for several times HAHAHA. But if I wasn’t keep asking to her, we might left by the bus. Be careful and keep asking if it’s already exceeding your departure time! We need around 9 hours from Kuala Lumpur to reach the country border of Malaysia and Thailand. After we came to the country border, we need to go down from the bus. The immigration processes should be done in 3 steps, first step is filling the white card immigration arrival form (don’t loose it, because u will need this when u go back to your country), second step is the immigration process in Malaysia border, and the third is the immigration process in Thailand border. Because it was a long-weekend, so the queue was quite long. We spent a total of 2 hours to finish the immigration processes. Tips : Be careful about the lines, there are 2 types of line : for Malaysian and for International. But the thing is that they didn’t put a guide board in every lines. So if you’re standing at the wrong line, you need to take line and start to queuing again from the beginning. Ask people first does your line is already correct or not. From Malaysia-Thailand country border, we need 1 more hour to arrive at Hatyai. The bus dropped us in front of Alisan Golden Coach Bus Agent. This is where the scam story begin! The hardest part of traveling to Thailand by bus is that we cannot book the tickets online before our departure. We can only buy the tickets after we are arrived in Thailand (both the Hatyai-KL ticket and the round-trip tickets for going to Krabi). After we arrived in Hat Yai, the scammers are approaching us in an impolite way. They always keep talking to us and taking our luggages without our permission to their tuk-tuk. It’s a very unappropriate manner, right? Actually we wanted to go to the bus station to buy the Krabi’s ticket. They said that they would bring us to the bus terminal. But you know what! They dropped us in a very near place that was a “scam travel agent”. We got very angry to them because they didn’t drop us into the bus station. But they said that it was also a bus station, and the main bus station didn’t sell the mini-van / bus tickets to Krabi. WHAAAT. I already know and did some research about it and of course, I didn’t believe in them. We didn’t know where is the place that they dropped us. My friends were already inside that scam travel agent and the agent gave us a very expensive rate. At that point I didn’t want to pay lah, my friends also did. My friends were doing debate with the travel agent, but I decided to go outside alone to find a honest person to talk to. I went to a pharmacy store near that travel agent, and asked where’s the real bus station. But unfortunately she didn’t understand what I said because she cannot speak English at all. Then I didn’t give up. I tried to find another person, and yeah I found. I talked to a woman that were selling foods and also sim card. I asked the same question to her, and she said that the real bus station is 3 kilometres from that place! So after that I know that the scam tuk-tuk driver was lying. After that I went to my friends again and told them to go to the real bus station. We tried to use a grab-car but it didn’t work. My friend asked the scamming tuk-tuk driver that brought us to that place if he wanted to dropped us in the bus station. But he didn’t want omg (I know that in his mind, he wants to get the high commission from the travel agent if we buy the tickets there). We left that place and find another tuk-tuk driver that want to dropped us to the bus station. In our way leaving that place, we met 3 Malaysian traveller that told us “You’re so lucky that didn’t take that travel agent. We got scammed and paid a lot amount of money to them”. Then I asked how much they paid. They paid 5.000 THB for 3 persons. OMG, SO EXPENSIVE! Although my total spending for my Thailand backpacking trip didn’t reach that amount. The real price of the mini-van ticket from Hatyai to Krabi should only around 250 THB per person. They scamming travel agent was so rude. Thank God we didn’t take that agent. Then every things were going well until we arrived in Krabi safely. At that night, we visited Krabi Night Market. The Night Market is selling a lot kind of foods in cheap prices (but most of them are non-halal food). I bought a pure Mango Juice and also a stick of pork. The taste was soooo good. We were there until around 10 pm. But suddenly, I got shock enough that someone was died at that time in the market. I don’t know who is he/she, but what I respect from Thailand people is that when someone is died, all of the people there were stopped from their activities and sing a song to respect that person. It’s quite scary and devoted at the same time. And I felt guilty enough because at that time I didn’t realize it and didn’t stop my step. I still getting busy taking pictures of my look-so-delicious Mango Juice, but then I stopped. On the next day, we went to the beach and temple. We visited Railay Beach (must using a long-tail boat to get there) and also Wat Kaew Korawaram (the white temple). The beach was very niceee. Railay Beach consists of 2 main beaches which are Railay West and Railay East. But you can go to both of the beaches by walking. 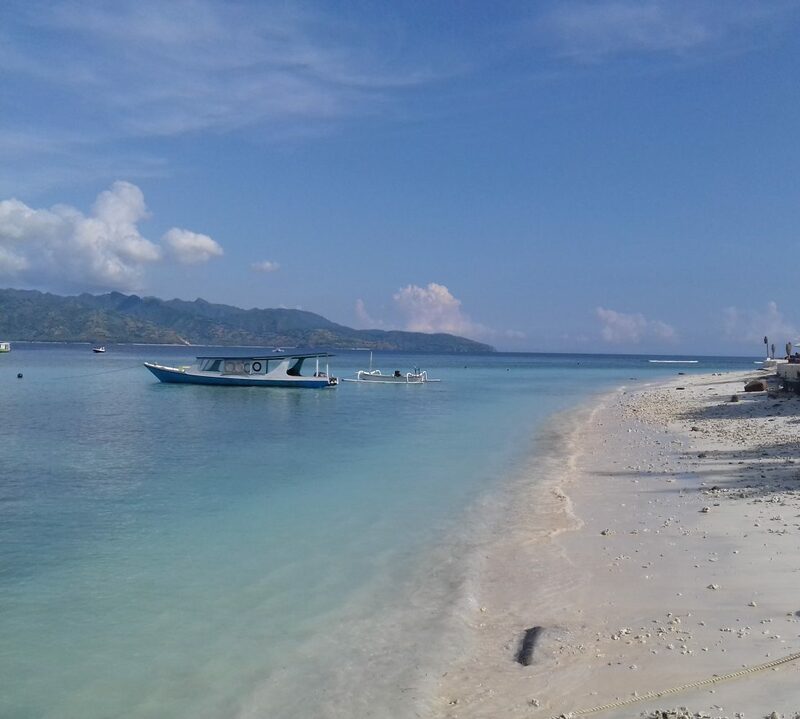 I could say that it’s as good as Lombok Island’s Beaches in Indonesia. But every beaches has its own characteristics. Lombok is greater at the colour-gradation of the water, and Krabi’s Beach has a unique clean green colour (maybe because they have different kinds of algae). Wat Kaew Korawaram is a pretty Buddhist temple that is located not far from Krabi Town. It looks like the temples in Chiang Rai, north Thailand. If you guys read my itinerary carefully, do you guys wondering on why the departure immigration processes took longer time than the return one? I will tell you the answer! We were taking the priority line since we put RM 10 inside our passport and the staff of the immigration was guided us to that line. Such an illegal way! But I enjoyed it HAHA. Including: Bus Ticket, Transportation in Malaysia and Thailand, Sim Card, Boat Rent, and Accomodation; Excluding: Food, Souvenirs (since every people money spending on food and souvenirs may be different to each other). I think that’s all about my backpacking trip story to Thailand. If you have the same experiences with me or wondering about something, you can share it with me in the comment box. Have you ever imagine visiting more than 12 tourism places in 2 days only with a little amount of money? Maybe some of you are not sure that it could be happen. Compare it with taking a tour since it will be much more expensive. Me personally, much prefer to do backpacking rather than joining a tour programme. Why? Because when I’m doing backpacking, I feel free to do anything I wanted to do, to visit some places that I wanted to visit, to take some a lot of pictures where I wanted to take or even stop for a while to get some foods; without making a big group of people waiting for me. I like it when I taste losing from a right way, straying in some places that I have never imagined before, or taking the wrong buses again and again. One word for backpacking experiences : CHALLENGING. Then, back to the topic. What do you guys know about Malaysia? Or have you ever visited Malaysia? I guess almost all of the tourists who visit Malaysia are going to Kuala Lumpur, as the most popular city because it has been a capital city of Malaysia. But do you know that Malaysia is not all about KL? There are some other good cities to visit, for example Malacca, Penang, Johor, Kota Kinabalu. Today I’ll write some things about Penang Island and everything related to it, some backpacking tips in Penang, and also its must-to-visit tourism places. Where is Penang? Penang is a part of Malaysia that is located on the northwest coast of Malaysia. It just 3 hours away by car from the state border of Malaysia and Thailand. 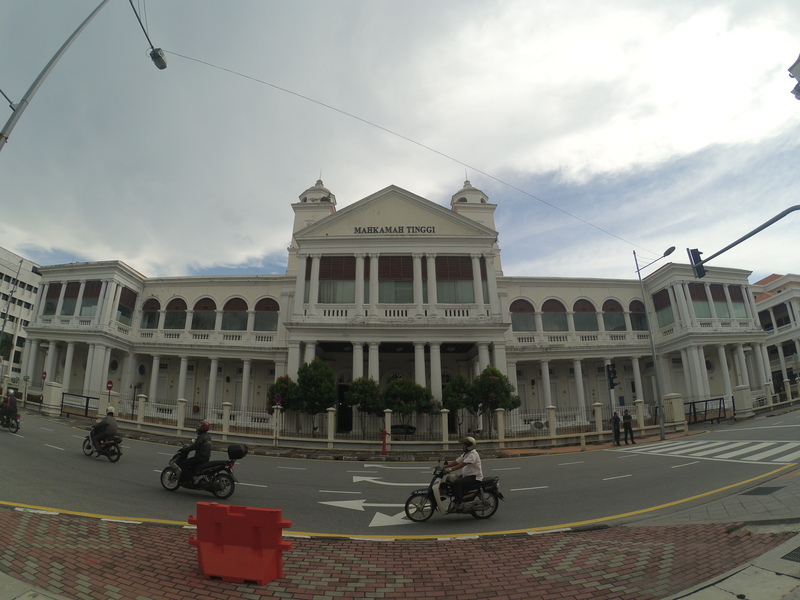 George Town, the city in the north part of Penang Island, is being the capital city of Penang. It took one hour drive from Penang International Airport (PIA). This marvelous city offers a lot of tourism attractions start from temples, street art, food stalls, beaches, old artsy buildings, churches, mosque, etc. The citizens of Penang Island are really diverse. We can easily find a lot of races there such as Melayu, Chinese and Indian. We can also find a lot of good-tasted foods from Chinese Food to Indian Food. The cost of food in Penang is also cheaper than in KL. Oh ya! I found the best “Teh Tarik” I’ve ever tried in my life. It costs only RM 1.80 ( even cheaper than the bus ticket hahaha) and the taste is different with another Teh Tarik both in Malaysia or outside Malaysia. I bought that 2 times because it was very addicting. I bought that in Ros Mutiara Restaurant, a 24 hours restaurant that located beside the hostel where I stay in. Are you guys wondering how much money I spent for this satisfying backpacker trip? I went to Penang for 2 days and 1 night. Actually you can go to Penang from KL by 3 options : using flight, bus, or train. I was using flight to go there. Why? Because I got a really cheap flight. The flight price for that day was the same with the train ticket. So yaa of course I prefer to use plane laah. It only took 1 hour flight, compare it with 4-5 hours by ETS train, or compare it with 5-6 hours by bus. And if you go there using the land transportations, you still need to cross the sea to reach Penang Island by using a ferry. That was the cheapest date for the flight. Another date are much more expensive than the date when I was going to Penang. So without being doubtful, I booked the flight ticket on that day. (Already Including : flight ticket, hotel, and transportation both in KL and Penang. Excluding : food & souvenirs, since every person will spend different amount for these things). Actually I also went to some other places that I already forgot the name :’) Hahaha. One of them is the Street Art in Penang, where I took some artsy pictures including the 3D bicycle mural that I posted in my instagram last month. Oh ya another good place to visit! If you guys still have time, you should visit Gurney also. It’s not far from Georgetown. Only around 20-30 minutes to go there by bus. I saw that place from the bus, but I didn’t stop because it was raining. 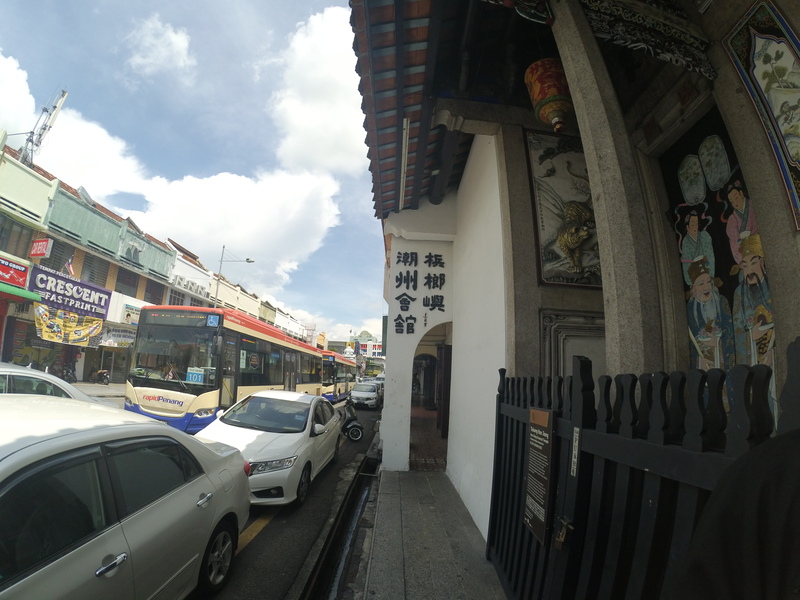 Penang people said that Gurney is also a nice place to visit. You can buy a lot of street food there at night. 1. Don’t use grab car. It’s much cheaper to use Rapid Penang Bus here. It’s really easy to use buses here since they are often pases. But make sure you’re taking the right bus by remembering / ask people about the bus number to go to a place. 2. Use Rapid Penang bus number AT or number 401 to go from Airport to George Town (round trip) and use Rapid Penang number 101 to go along the north coast line (Little India – Gurney – Batu Ferringhi). 3. Don’t be shy to ask to everyone. Since everyone in Penang are nice and really helpful in giving directions. 4. Go visit Gurney also. I get through Gurney, but didn’t stop because it was raining. The local people said that it is also as good as Batu Feringghi Beach. Actually I can save more money if I didn’t use the KL Express Train. But unfortunately, I was in rush and need to go to the airport as soon as possible to catch my flight. If you want to reduce your expense, don’t ever use KL Express Train from Kuala Lumpur to Kuala Lumpur International Airport. Although the train is comfortable, the ticket price is quite expensive for backpackers, 55 RM for one way. 6. 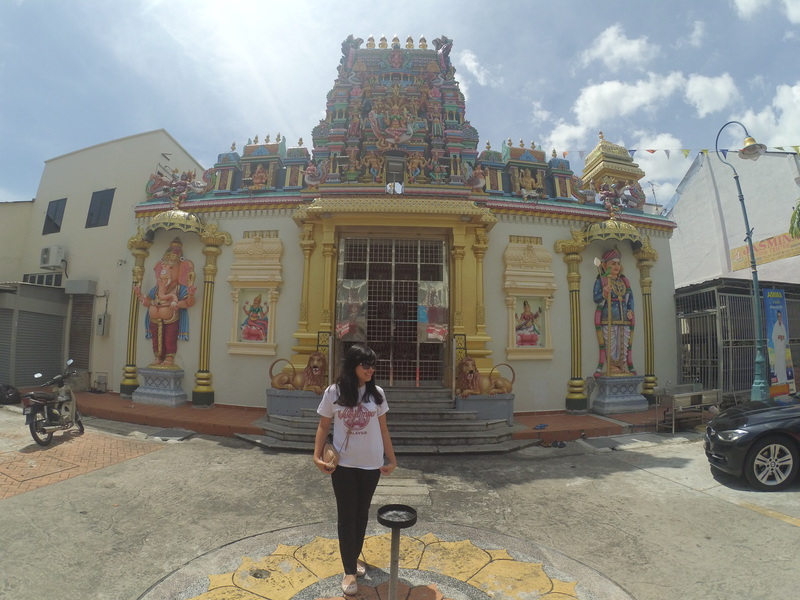 Visit Little Indian area in George Town. It provides good food with cheap cost. 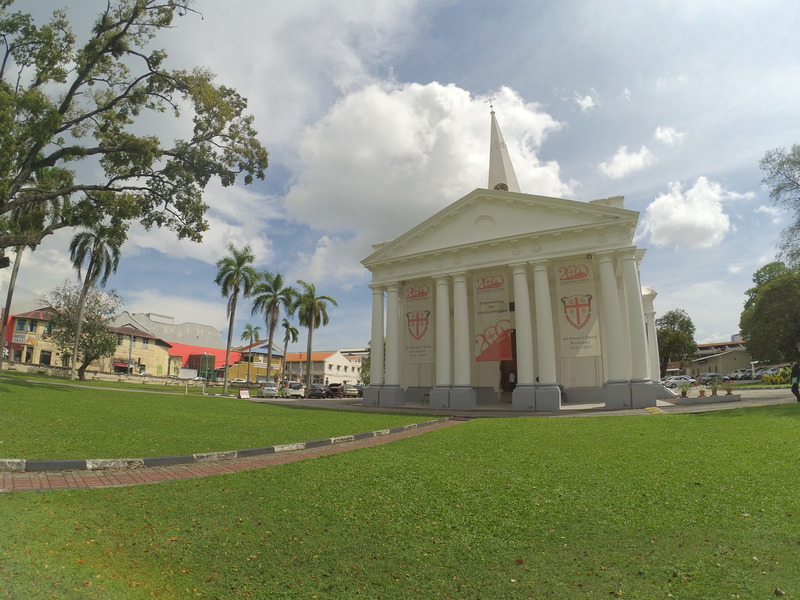 Most of the tourism spots in George Town are in this area. And you can just walking from one place to another place since it’s really near. Tips for short trip Penang backpackers : Take the free map in the airport because it will help you a lot in deciding the places to visit and looking for the venues. It will help you to go faster from I place to another places. If you’re strong enough to walk, you can visit much more places than me. Just use your time wisely, for taking pictures or going inside the venues. 7. Visit Batu Ferringghi. Although it is a little bit far from George Town (about 1 hour using bus), the beach is really clean and nice. Especially for watching sunrise / sunset. This beach is also providing water-sport games. To go here, you can use Rapid Penang Bus again (number 101) for only RM 2.70 each trip. It’s really cheap and you’ll regret if you do not come here. 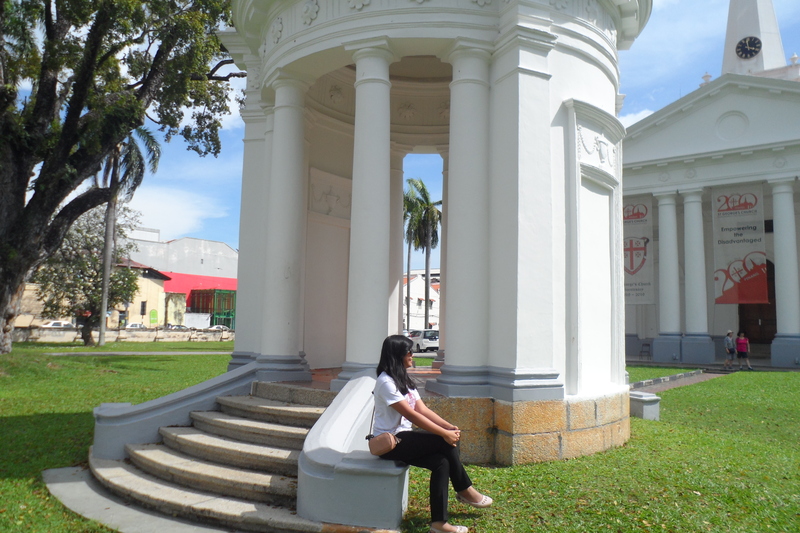 I’m Fransiska Sonia Rickiyanto, checking out from my Penang Backpacker Trip. How about yours? Mount Batulao is located in Nasugbu, near Tagaytay City. While Tagaytay City is located in Cavite Province, the Philippines. It’s only 2-3 hours drive from Manila. Mount Batulao has been a famous hiking and camping destination for most hikers, especially for beginners. There are two major trails at this mountain, the New Trail and the Old Trail. I was using the old trail (it’s more difficult than the new trail). These trails can be combined for a traverse climb. I went there with 3 people; two people from Germany and one from Indonesia too. Because only us in our dorm that didn’t go to work on Tuesday. So we decided to leave Manila for a day-trip to Mt. Batulao. We were being backpackers, so we used the combination of public transportation and only spent a little amount of money. Me personally, only spent less than 500 Philippine Pesos (less than 10 USD). It was already for covering food, entrance fee, transportation costs, etc. or if I convert it to my country currency, it’s around IDR 123.000 only. Actually it was the cost from Quezon City to Mt. Batulao, since we lived near SM City North EDSA, Quezon City. But if you go there from Manila City, it will be a little bit cheaper because of the transportation costs from Quezon City to Manila and vice versa. Oh ya! The trip is already including a side-trip also to see Taal Volcano Lake, Tagaytay. You can just stop for a while and taking some pictures from the street. Because we were backpackers, we brought only one backpack each person. Don’t bring too much things for mount-climbing, because it will make you climb harder and feel more tired. I suggest you to use a pair of sneakers for backpacking, since too much walking can make your feet feel hurt if you use uncomfortable shoes.